This entry was posted in Racing on April 3, 2011 by Steve Tilford. 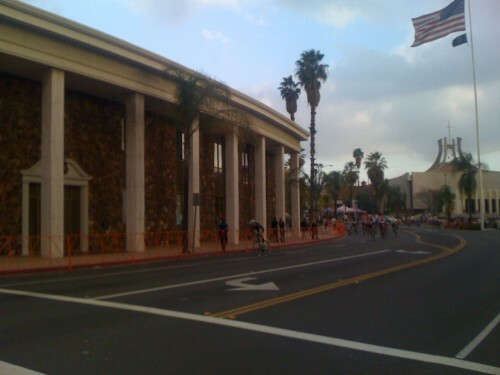 If you’ve read most of my stuff, you’d know how much I despise criteriums during stage races, from a racers point of view and a spectator’s point of view. It is normally super controlled by the race leader’s team. So much so that it becomes a non stage. That was pretty much the case here at Redlands, but not completely. I was surprised because the race was mildly entertaining. Macebo’s, RealCyclist.com team, set tempo the first half. But, after about 40 minutes, the race got a little out of control from them. A 9 or 10 guy break formed and Bissell had to go to the front and reel them in. But, another group wet off the front and Bissell had Andy Jacques-Maynes in it, so they stop pulling. A mish mash of teams got to the front, but 6 guys were still away, just a bit, with one to go. The field came up on them, with the Pure Black rider, Roman Van Uden, was leading it out with two corners to go. A Jelly Belly guy got up against the barriers and fell. That left Bernard a huge gap with 200 meters to go. He was not going to win that race without the crash. 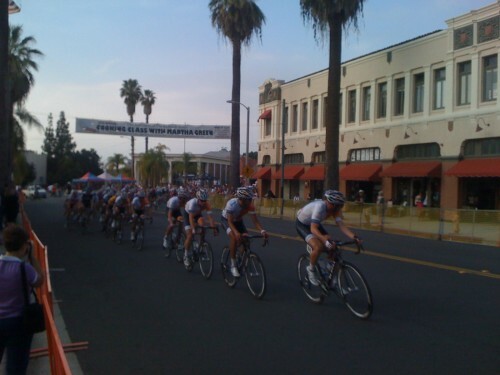 But, that is bike racing. The race was a bit more animated than I thought. But, that is mainly because that the RealCyclist.com team is not that strong. Tomorrow is going to be a very, very hard day for them. I hope they remember that a good offense is sometimes a good defense. Pretty much the first half of the race. Realcyclist.com. Bissell took over about half way in. Boring. Roman Van Uden (Pure Black Racing) has an enormous gap with one corner to go. 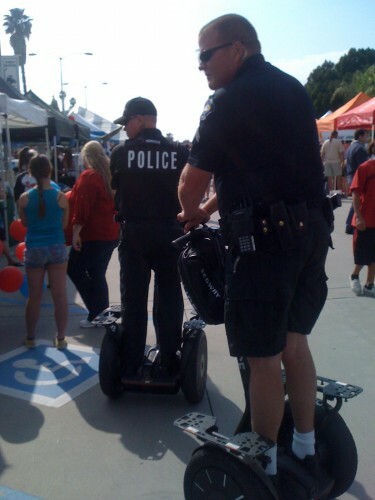 Our finest saving up a bunch of calories by just standing instead of walking. Besides being a home foreclosure hotspot, hot and smoggy much of the year, there’s not much going on. I understand why the area does it. The tourism dollars definitely help. 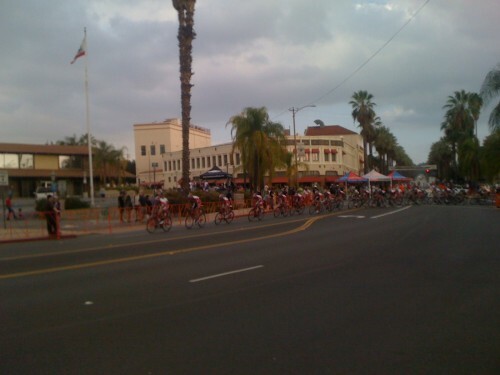 Given USAC’s disinterest in grass roots cycling, the promoters/event will probably continue just like this until Weisel lines up a Tour de Sandwich scam around San Diego. As an aside, it’s early days in the racing calendar. Look at where you are, rework somethings and you may be going great later in the summer. Puts new meaning to being called a “Flat-Foot”.